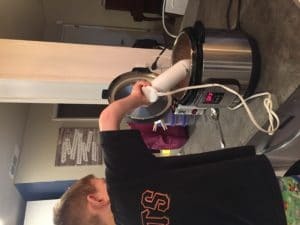 What is this Instant Pot craze? A quick personal note: I have not been around on this blog much recently. It has made me sad to take a break but it was needed. Pregnancy + Holidays + sickness kind of got the best of me. But here we are on the other side and I’m excited to continue this blog journey in 2017. Also, we have all taken a little much-needed break from the Kitchen Remodel, but it is nearly finished. When it is, you’ll be sure to see the whole beautiful thing! I’m hoping to post a video so you can see it in all of its glory! for now if you want to catch up on what we have done you can head over here! I hope you’ll stick with me and even share with friends! And I pray your 2017 has started with health and excitement for the future! For now, let’s talk about What is this Instant Pot Craze? 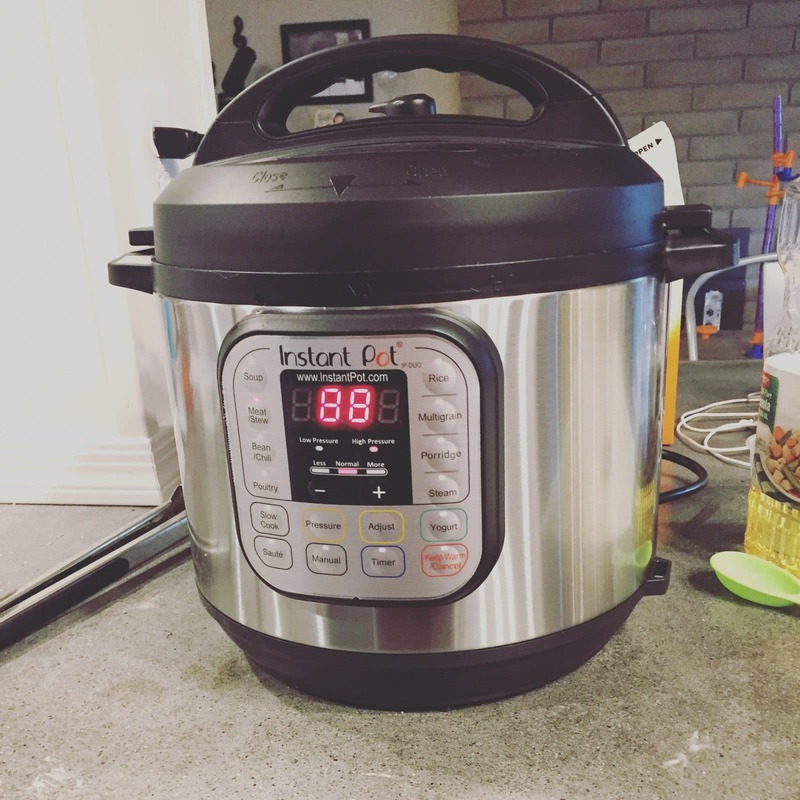 Well, you’ve probably heard about the amazing Instant Pot! It seems to be all over the internet world. And for Christmas Ryan surprised me with one, so now I’ve joined the craziness and I have to admit, it is pretty fantastically amazing! If you are like me, you’ve been hearing a lot about this kitchen appliance and kind of thinking everyone was a little obsessed and crazy about it. Like Come on, I’m sure it’s nice, but really? What is this Instant Pot Craze all about anyways? Now that I have had it for a little over a week and have used it every single day… I will gladly join the crazy crowd!! And I’m now even one of those folks that say I will use it multiple times a day! I even cooked in it all day to prepare 30 days worth of Instant Pot dinners for 30 days!!!! 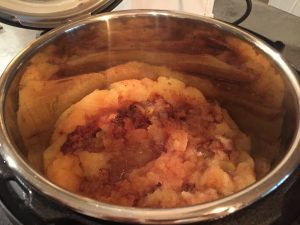 You can read about my once a month cooking experience here. It’s a pressure cooker extraordinaire! Today I actually have plans to use it 3 times! Right now I’m making applesauce! Here’s the recipe from pinterest. We used our immersion blender to smooth it all! It worked perfectly! My little helper! It’s becoming so much more fun now that he can help and he is really good at it when he listens to instructions! For lunch I have plans to make an artichoke, one of my newest pregnancy cravings and this recipe is the best I’ve ever had!! For dinner it will be one of my freezer meals from my once a month cooking adventure.. which takes NO THAWING out time and will be super easy! I think tonight we’ll have the spaghetti with bacon! And all I will need to do is boil the pasta! Do you have one? What is your favorite thing about it? Have any questions about them? I’m still learning but we can discover together. Also, I have a Instant Pot board on Pinterest, sooo check out what I’m trying. There are a few different models of Instant Pots and sizes. I have the 6 quart I would say any bigger of a family (we are 4 going on 5) would want the 8 quart and I may upgrade at some point. There is even a Smart Blue-tooth enabled one.. fancy!!! This post contains Affiliate links. If you shop through the links, the companies will send me a little thank you commission for advertising but at no extra charge to you! 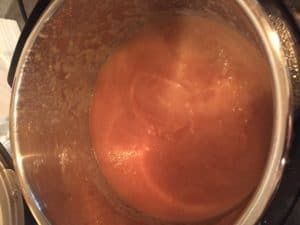 This entry was posted in Cooking Adventures, Life in general, Products We Love and tagged Amazon, christmas, cooking, home, Instant pot, kitchen, once a month. Bookmark the permalink. 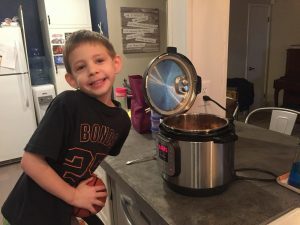 I just got an instant pot for Christmas and it’s already being used daily! I’m in love! I especially love just putting veggies in there for a side. They are cooked well and taste amazing!